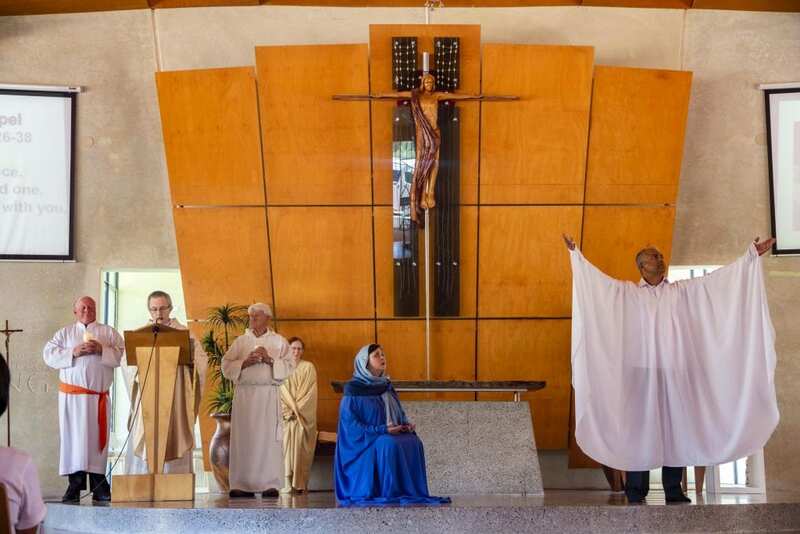 The readings were interpreted with movements the PAS and IdentityWA Christmas Mass and celebrations on 8 December 2018. Photo: Amanda Murthy. Father Nino Vinciguerra delivered this message at joint IdentityWA and Personal Advocacy Service (PAS) final Mass for the year and Christmas celebrations that took place on Saturday 8 December at the Mercy College Koondoola Chapel. More than 350 people from both communities, including 120 volunteers and some agency staff, participated in the Mass, with many of the members serving in the choir, and conducting the special liturgical movement to accompany the readings of the day. Fr Nino reminded the congregation that Jesus loves them and will never leave them during the PAS and IdentityWA Christmas Mass and celebrations on 8 December 2018. Photo: Amanda Murthy. “Jesus brings us forgiveness, He is always with us,” he said. “Sometimes when I look in the mirror in the morning, I feel afraid. “But that’s not really true, because if I take a really good look in the mirror, I will hear those words of Jesus ‘You don’t have to be afraid today because you are special, you are good,” added Fr Nino. Mother and daughter pose after the PAS and IdentityWA Christmas Mass on 8 December 2018. Photo: Amanda Murthy. Fr Nino then told those present that they have the responsibility to encourage others whenever they are feeling down. Some 350 members together with their families gathered for a PAS and IdentityWA Christmas Mass and celebrations on 8 December 2018. Photo: Amanda Murthy. At the conclusion of Mass, a series of traditional Christmas carols were sung, spotting a chapel full of smiles and applause all those present. A generous feast prepared by IdentityWA was then enjoyed by all at the school hall. Long-time PAS volunteer Robyn Hoffman said the year-end Mass and celebrations is a tradition that must go on.